The leaders of this city should be ashamed that they have allowed the suffering of Tucson Bus Riders to go on for almost four weeks. The Tucson Bus Riders Union has had many community leaders look at the City’s contract with Professional Transit Management. They all have told us that it is blatantly obvious that city officials can do much more to end this strike. Because of this desperate situation, The Bus Riders Union has determined that direct action is long overdue. It is time we lay our bodies on the line. Will the cops arrest us for not paying to get on the bus this Thursday at 4 p.m.? 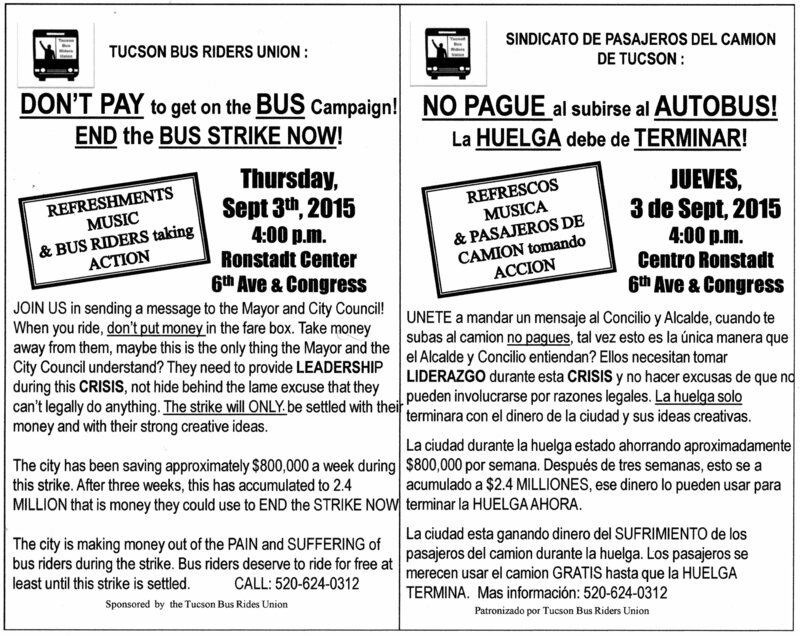 Our goal is to communicate with every bus rider in Tucson about not paying when getting on the bus until this strike is settled. Please attend on Thursday, September 3. What if they just stopped all service? Who does that hurt? S.
I’m confused… …Casa Maria is promoting the not paying transit fares in Tucson? …this seems like theft. In my opinion, getting arrested or not, stealing is not acceptable.